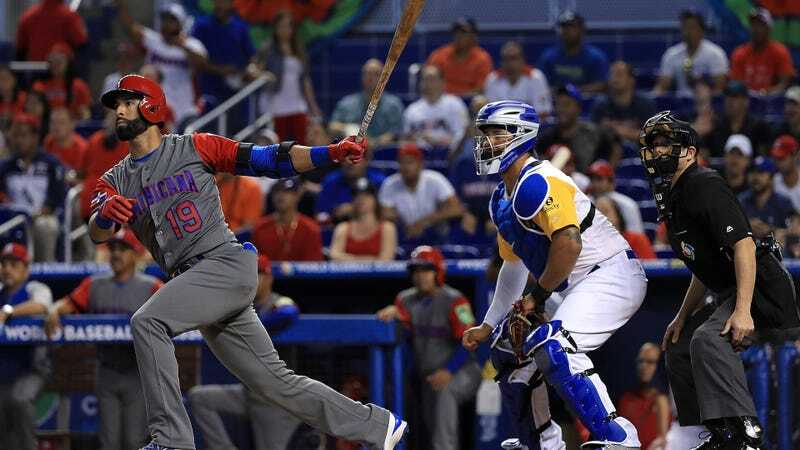 The Dominican Republic and Colombia battled through eleven innings of competitive, engaging baseball this afternoon that ended with the cheap artificiality of the World Baseball Classic’s extra-innings rules. What had been an entertaining, high-energy game slowed with the boring procedural moves of a sac bunt and an intentional walk. The situation—bases loaded in extra innings!—is one that should demand excitement, but that’s difficult when it’s the result of a starting scenario ripped from its context. Excitement is the natural byproduct of the anticipation that builds as the game moves on, not something that can be manually recreated by forcibly changing an RE24 state. While it’s a change designed to make the game shorter rather than more exciting—though many of the arguments here tend to wrongly assume those things are one and the same—it didn’t do much for game length in this case, either, as the advantageous starting position helped the Dominicans score seven runs in a seemingly endless eleventh inning to walk away with the 10-3 victory. For a short-term event like the WBC, these rules make some sense. They’re in the same vein as the tournament’s cap on pitcher usage, something instituted to keep teams healthy and keep games shorter during an event that’s a brief side gig for the players involved. But for MLB, which is considering them for the future and will test them in minor leagues this year, it’s far less appealing. This game showed it.